Happy new year, and as it's been so long since the beginning of the year, happy Waitangi day as well! January has been pretty action packed for me – moving into our new house, then unpacking things and figuring out where they should all go. In our old place, I had a small study, and part of the spare room upstairs to work and store all my work and candle paraphenalia. As getting between the two was quite awkward, I ended up working off the kitchen table a lot. 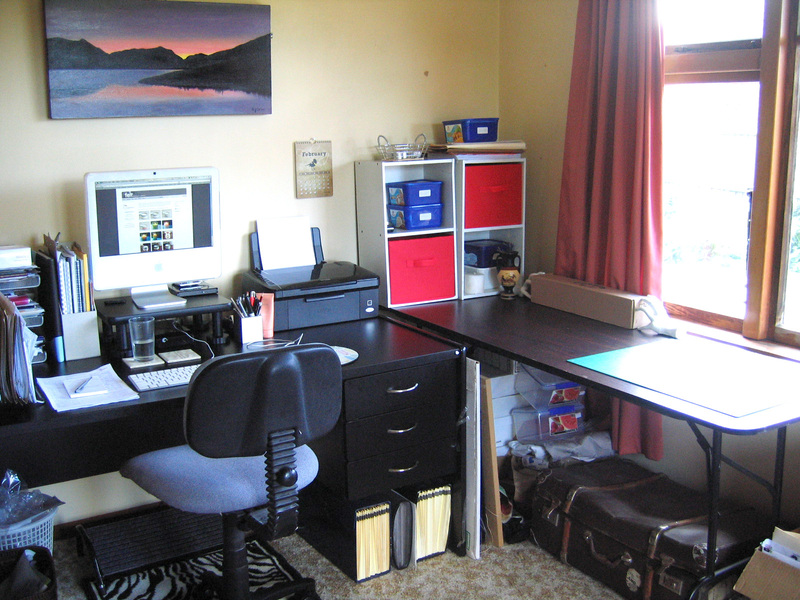 Now I have a proper office space, and we have a seperate spare room, which is much better. It's taken me a while to work out where everything is going to go, but things are slowly falling into place. This room has lovely big windows, so it's very light, but also rather difficult to photograph properly, so please excuse the quality of the images. My workspace, with my desk for all the computer stuff, and my old trestle table for candle finishing, and packing etc. The little shelves at the end of the table are what I use on my table at markets, and when they aren't being used for that, they make good storage. I bought some of the little boxes that go with them to make it super easy to transition them from 'storage' to 'market' mode. 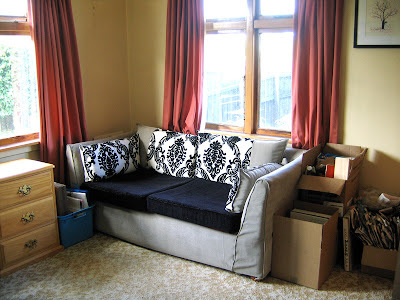 After spending so much time re-covering my old couch, it deserved pride of place. It's also nice to have a spot to relax and read, or whilst coming up with ideas. 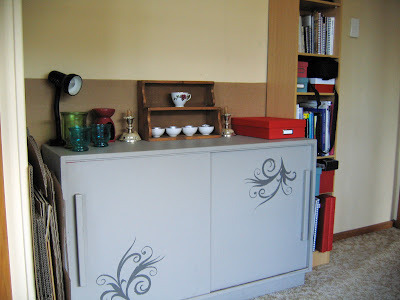 This cabinet used to live in the lounge, and hold the fish tank. After twice being tipped over in subsequent earthquakes from the water sloshing about, and smashing the tanks, it has been retired as a fish tank stand. It's new job is storing all my candles, and as a place to test the prototypes. I won this print 'Pause" a while back from Ana Aceves. 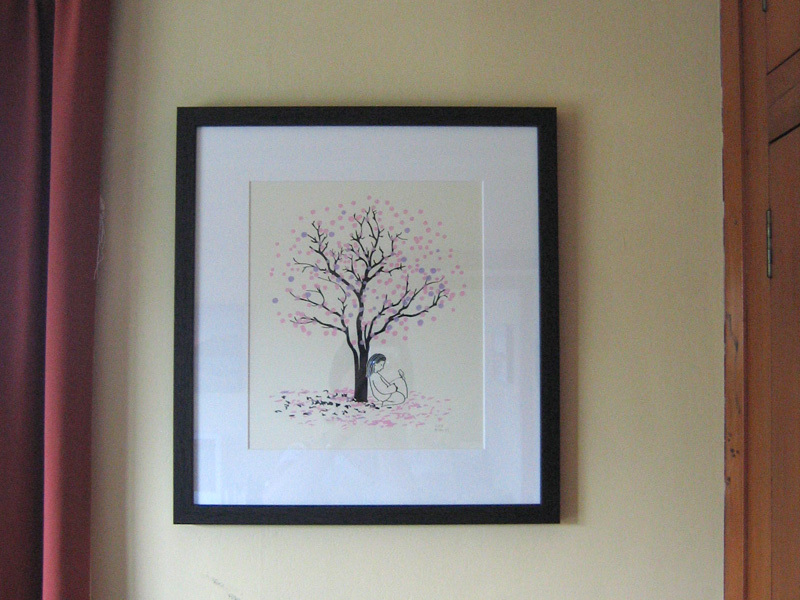 I finally got it framed recently, so I can hang it on the wall, and it looks great! My office is never this tidy – I wish it was. I had to 'hide' a few boxes of extra things I'm not sure what to do with yet out in the hall so I could take these photos. I did leave a few behind though, just for authenticity. Next week, I will aim to make my new candle making space presentable, and put up some photos of that as well. Congratulations on the new space! I think they are a constant work in progress as we develop. Love what looks to be the rimu joinery in your new abode! Fantastic Rose - so lovely to have your own space set up the way you want it :) Love that you have a couch there too, encourages you to take breaks when you need! Well done, I'm in the same boat figuring out where to put everything now that I've painted and I'm properly moved in. Fun times!